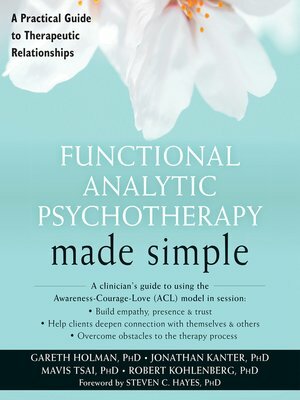 Cowritten with the founders of functional analytic psychotherapy, Functional Analytic Psychotherapy Made Simple offers a practical, behavioral treatment approach focused on client interpersonal relationships and the therapeutic relationship. Functional analytic psychotherapy (FAP) is a research-based treatment for mental health disorders and has been shown to enhance the quality of interpersonal relationships. If you're a therapist, how you relate to your clients can have a profound impact on treatment outcomes. This book integrates the latest research on the importance of the therapist-client relationship with the new science of social connection into a user-friendly, flexible clinical framework. In this book, you'll find an introduction to the conceptual foundations and clinical practice of FAP, with an emphasis on practical clinical scenarios and personal reflection. You'll learn the theoretical basis of FAP in contextual behavioral science and how to apply functional analysis—the core assessment method of behavior therapy—to the therapeutic relationship. You'll learn to understand the therapeutic relationship and social connection in terms of the Awareness, Courage, and Love model. You'll also learn how to balance authenticity and compassion with strategy and case conceptualization to make your therapeutic relationships more compassionate, flexible, and effective. And finally, you'll discover how to apply principles to effectively cope with challenging moments in the therapeutic relationships—such as how to address ineffective behavior happening in the therapy interaction from the first moment of therapy, what to do when therapy does not seem to be progressing, and how to end therapy well. No matter your treatment background, this book will provide invaluable strategies for adopting functional analytic psychotherapy in your practice, enhancing relationships with your clients, and improving overall treatment outcomes. Mavis Tsai, PhD, is cofounder of FAP, and director of the FAP Specialty Clinic at the University of Washington. Tsai has an international following as a trainer, consultant, and clinician.